Britons and most Europeans have lost an hour of sleep this weekend after clocks went forward by one hour, marking the official end of winter. Oh good, the clock on my video will be right again! If we kept CET all year round, children would be going to school in the dark in Winter in Northern Britain. For the safety of these children, I think the change is necessary. My girlfriend has just left for an exercise class at the fitness centre. She should just arrive for the end. Glad you told me. I'm flying off on holiday tomorrow and had no idea about the time change! It should be BST all year round. The early dark hours of winter under GMT is so very depressing. That one extra hour of daylight in the afternoon would help lift spirits more. I celebrate clocks forward and curse clocks back. Never mind about continental Europe and business. Let business get used to what is more important in life - mental welfare in its more natural state! 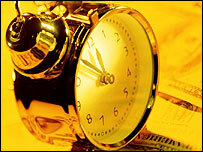 As a teenager, I despise the clocks going forward, as to me it means getting up earlier, which is a hated idea. I didn't realise until today (Easter Sunday) that the rest of the world, let alone the rest of the continent doesn't perform this pointless act. As it was made to let farmers have longer daylight hours, can't we just scrap it now, as the population of farmers is an awful lot smaller than it was in the 16th Century?! This is very bad news for me, indeed. I am very hung-over, have to be at a barbecue in an hour and I need a bath. I could have put that extra hour to good use! A large degree of ignorance is shown towards daylight saving. People fail to realise that in so called "modern times", our food is still produced by farmers! Andy Taylor is wrong: for years the EU has had synchronised daylight savings time changes, so the UK and France are never share the same time. Cleebs should also note that the majority of first-world countries use daylight saving time, including the EU and most of the US. My mum said she would change her kitchen clock. We later noticed it was now 2 hours early! I like the hour change. It means that on the southwest coast of Wales, it's almost 11pm before it gets dark in the middle of summer. It's fantastic if you're down at the beach having a late night BBQ! What I've lost an hour? Where's it gone? Who can investigate? Yes, that's a good idea, The Doctor can get me my hour back. He was jolly good with the Wheelie Bins last night! Nice to see that the opponents of daylight saving all seem to live in the south of England, the people least affected by the change of seasons. Please afford some consideration to those of us in the north of Scotland, where a change to CET would be disastrous. A god send for me, my little baby has been waking up at 7am for the last 4 months, now he wakes up at 8am. I can cope with that! My computer knows when - I don't. Good enough for me - at least the computer knows when it is time to go to Grandma's house. Changing the clocks every six months drives me mad. I'm the Systems Manager for a school, and you wouldn't believe the amount of things you need to change the time on... school bells, security systems, file servers, fax machines - the list goes on. I use 'Spring forward, Fall back' to remember. Another emergency war measure like income tax and pub hours which never went away. Let's standardise on BST or CET and have no daylight saving. It worked for a couple of years in the 70's. Buy radio controlled clocks and watches. The only adjustment I had to make was to my cooker. Everything else in the house, including my watch, sorted themselves out on their own. Living in a country much closer to the equator, where on the longest day the sun sets at 19:10, and not having a clock change, let me say that daylight saving is great idea. Trying to get even half a round of golf in after work is a major difficulty. Comments from those who want to abolish BST really don't take into account those of us who enjoy summer sports. I don't care about takeaways and internet shopping, but what I do care about is the extra daylight between finishing work at 5pm and dusk setting in. BST makes a BIG difference to me ! I agree with others. We are in the 21st century and there is really little need to change time twice a year. Farms here work by night with lights on their tractors etc. Why not all agree on a acceptable time for the whole of Western Europe including the UK so the EU block has same time and leave it at that? It will save a lot of time and money in the long run. Cleebs is wrong in saying that everyone else leaves their clocks alone. Many countries do the same for the same reason - to take advantage of longer summer evenings without the penalty of a late dawn in the winter. I say, "keep the change!" It makes perfect sense to me why we do it, I enjoy the long summer nights, an extra hour spending time with friends and family having a beer or two as the sun sets in the garden at around 9:30pm instead of 8:30pm is great. Myself, as with the majority of others, are not up at around 5am in the morning to benefit from the earlier sunrise which would result if we left it as GMT! Keep BST. Like Imraan Satharm, I fail to see how the supposed improvement outweighs the costs and complication of changing clocks backwards and forwards twice a year. Last year I tried to find real scientific evidence that there is any benefit to this ridiculous tradition - there is none! Best I could find was a study in the US during the early seventies that there may be a small reduction in oil consumption (in the order of one or two percent) - but not only was this before the rise of 24-hour economy and always-on technology, it even falls within the margin of error of the study! The whole thing's a stupid waste of time, in my opinion. I think Imraan Sathar's comment is excellent, lets just switch to CET and persuade the rest of Europe to stick to one time zone all year... all it does is cause havoc twice a year, every year. I've missed Countryfile and now just feel like going to bed, yawn. Three weeks ago we got up an hour early as we thought the it was the weekend the clocks went back (but didn't bother to check). Last night we didn't know it was that time AGAIN so had an extra hour in bed! Have only just discovered that it's lunch time by my computer clock! The daylight saving was kept in place because it benefits the farmers who need the early light to carry out work on the farms. I'm sure this is the reason we were taught in school as to why we kept it after the American chap changed it!! I don't know what all the fuss is about? - I'm an Engineer Officer onboard a large cruise ship. We advance and retard clocks twice during our weekly cruises as we cross between different time zones. I've just completed a 4-month tour of duty, returned home and found that I yet again have to 'flog' the clocks. It never ends! I can't understand why people are making a fuss over the time changing! Is it because people are getting far too lazy to manually change the timings which display on their clocks or because it is only one hour less sleep? You would think that with an election coming up people would have more important issues to discuss rather than how much they dislike daylight saving! Lets put things into perspective here! I am from London, I live in Brisbane. Here in Queensland our clocks don't change, ever! For the farmers I think. I miss British Summer Time. I wish they would bring it in here, so in the summer it is light later to see the beautiful scenery. Some of us are not losing an hour of sleep but having to work an hour less at work. My 12-hour night shift at the hospital has become an 11-hour one. The glass is not necessarily half empty! Why can't we just change our clocks to GMT+30 mins and leave it there for ever? To remind me which way to turn the clock, an army MARCHes forward and FALLs back. I was one of the victims of the time change many years ago on visit to the UK I omitted to notice that the one hour time change had occurred and I miss all my connections to Europe. Good job I just read this...! Clocks going forwards, eh? Catches me out every single time! There's got to be something wrong with a time zone which is not consistent, and is in addition common with the continent for just one week per year. Well I don't know what clocks you're all using, most of mine seem to figure it all out for themselves! I think daylight saving is out of date. I haven't heard a 21st Century reason for keeping it as it is. There's more time wasted wandering around the house and car changing clocks compared to the supposed benefits. And what are they exactly? Let's keep time as it should be and not mess around with it. Leave it as it is, like the rest of the world. I totally got caught out by it this time. I was staying up late and to my horror it was only 12.59 a few minutes back, next thing I know it's 2.00. I prefer when clocks go back - an extra hour in bed! This change in the UK is a blessing to me. I'm on assignment in Korea at the moment, and during winter, the nine hour difference always meant the UK office was just opening when I was supposed to be leaving. Now at eight hours, I have one hour at the end of the day when people in the UK will be available, meaning I can go home earlier! It seems absurd in this day and age that we still need to adjust our clocks for "daylight savings". We now live in a 24 hour culture when take-aways are open till three in the morning and internet shopping is available all day. I don't see any real benefit to adjusting our time for the summer whatsoever. I agree there may be a case for switching to CET - it is sometimes frustrating when at around 1630 business with Europe stops due to a time difference. Maybe we should consider a switch to CET all year round, and convince Europe to scrap their daylight savings time?